Well, as expected, the propagation over the north pole was useless the last night, and no signals from North America was heard what so ever. Not even carriers. However, as could be expected regarding the current conditions, signals from middle east was dominating the mediumwave band. African stations, with the exception of Sudan on 1296 KHz, VOA Sao Tomé on 1530, Radio Sawa / Djibouti on 1431 KHz and the bunch of common egyptian stations, are generally very rare up here in the extreme north, so I was pleasantly surprised when I heard a portuguese speaking station on 1223,98 KHz at 21:47 UTC, having quite a battle with co-channels Galei Zahal and Voice of the Islamic Republic of Iran. After consulting WRTH and other lists, I came to the conclusion that it probably was Emisora Provincial de Cabo Delgado in Pemba, Mozambique that I had the honor of listening to, as there are no other portuguese speaking stations listed on this frequency. The reward came at 22:00 with an annoncement for the news transmission “Último Jornal” followed by a perfect ID: “Rádio Mocambique – Cabo Delgado”. The audio clip with the ID is found here. Listen to it, and if you download it – please don’t use it to send your own fake reception reports. Thanks! The station was heard with quite good signals at times, carriyng a late night show with african popular music for about yet an hour, before it faded out completely at 2301 UTC. Ok, it seems to be time to check that the BOG:s and the rest of my portable equipment still works, since last season. I’m will try some listening from the car out on Cape Skagen here in Vardø during this weekend. Conditions are predicted to become pretty lousy, so don’t expect any sensational logs this time. Still, it’s always a good idea to do a pre-season “mini-pedition”, just to check the equipment and to identify things that can be improved. Two DXpeditions to the Aihkiniemi DX-cabin in Finnish Lapland is now booked. I’m going to be in Aihkiniemi from November 24 to December 1 and from January 5 to 12. I guess that spending two weeks in this fantastic location in mid-winter will bring me quite a few new ones in the log. Actually, Aihkinimi is not very far from Vardø, where I live. About 4 hours with car from Vardø on snow-free roads, and maybe an hour longer during winter conditions. More about my Aihkiniemi DXpeditions later on. 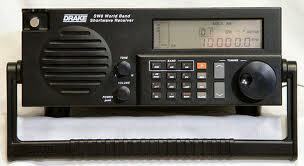 There is one thing that I have to admit: I have an obsession for radios made by the R. L. Drake company in Ohio. I have owned several C-lines, TR7/R7-lines, a SPR-4 and a R8. Being the happy owner of a R8A (wonderful radio, by the way), I was lucky enough to find a late serial SW8 on eBay – AND the seller was willing to ship the radio overseas. The late serial model differs from the early ones, having the telescope whip amplifier, coverage down to 100 KHz and the sideband selectable AM-sync. The late SW8 is said to be the “poor man’s R8B”, and I just can’t wait to receive the parcel from the U.S. Received the Afedri SDR last saturday, and have been listening around with the it during three days now, and I must say that I’m impressed by it’s performance versus it’s price. There was a few “hickups” during the setup-process, but thanks to help and assistance from Alex and a number of members in the Afedri yahoo-group, everything went well. I’ve noticed that the stock AC/DC adapter to my laptop (Asus X35E) generates about 5-6 dB of noise, so I have been running the PC on it’s internal battery. However, powering the Afedri from the PC’s USB outlet “eats” battery, and running the PC in “powersave modus” isn’t an option, because it seems that the Afedris VGA doesn’t work properly (I will investigate this closer later on). I have modified an USB cable to allow me to power the Afedri from a regulated (non-switch mode) power supply adjusted to +5V. This works really good, and allows me to run the computer on it’s own battery in powersave modus, without less performance from the Afedri. In any case, I think that the Afedri SDR represents an exceptional value, considering it’s price. I think it’s very similar to the SDR-IQ (I haven’t yet tried any other SDR’s). The IF-recording capabilities is really impressive, and extremely useful during MW-DXing sessions. I beleive that the Afedri will become a very useful tool during my Aihkiniemi DXpedition later this season.